When we first looked at the Albatron PX845EPro which comes from a relative new comer to the motherboard industry we were very impressed. The question today is how it will fair against some tough competition where performance levels are the the sole deciding factor? Looking at the benchmarks we know that the Albatron PX845E Pro does very well; it has the hardware to rival any other competitor and features like on board 10/100 LAN, 5.1 (software codec) audio, IDE RAID, memory stick and smart card compatibility and even dual BIOS's! 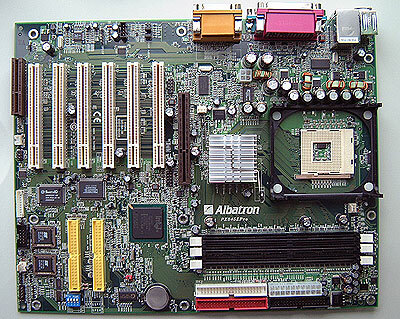 Even with the high level of integration, Albatron still kept the PX845EPro very upgradeable with a 4x AGP (1.5V lock), six PCI slots and three DIMM slots. Overclockers will appreciate that at 133 MHz FSB you can enable the "266 MHz" memory operation which really means the memory is running faster then the FSB. This is extremely useful and helps give the PX845EPro better performance since it gives the P4 processor more bandwidth. The BIOS on the PX845EPro is based on the Phoenix system which is very similar to the ones found on Asus motherboards. It's not any better or worse then the Award BIOS's we're used to, but it take a bit of getting use to. In the BIOS, Albatron give the user a lot of power to change CPU voltages as high as 1.85V, FSB adjustments all the way up to 248 MHz FSB (in 1 MHz increments) and AGP voltage that can reach 1.6V. Memory voltages can also be tweaked to 2.8V if you feel your DDR is acting up. In terms of overclocking we were able to get the test 1.6A up to a 163 MHz FSB, anything higher and the system refused to POST. About the only thing we can complain about is the board's availability. I've received many e-mails from users asking where to buy only to tell them that I don't know. Hopefully Albatron can get this motherboard out quickly because it is one of the better boards that we've tested. So good in fact that it currently forms the basis of the PCstats.com Pentium 4 test system.